The history of Mary Magdalene, First Apostle, began on August 16, 2009, with the ordination of Mary Smith, attended by many persons from the St. Cloud area. On the drive home, Bernie Sykora broached an idea to the others in her car, Larene Hark and Julianna Howard. 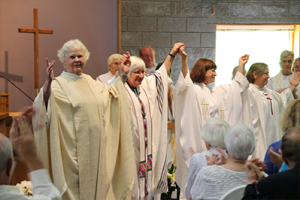 How about having one of the women ordained preside over a Mass in Sartell? They included Rose Serrano to help plan a Mass for a few people in Bernie’s apartment. The idea generated so much interest that the card room of Bernie’s apartment was rented, and there Mary Smith celebrated the first Eucharist for our group on December 12, 2009. Linda Wilcox, ordained with Mary in August, gave the homily. Julianna Howard led the singing of her own lively compositions from her keyboard (We Are the Circle: Celebrating the Feminine in Song and Ritual. In the same location, Mary celebrated the next Mass on April 17 of 2010 with a number of Benedictine and Franciscan religious sisters in attendance. This was before the Vatican announced its decision to investigate religious sisters in the U.S. Two more Masses took place there, in June and August of 2010. A social with snacks followed every Mass, and our community was having regular meetings to make further plans. On August 26, 2010, we had our first meeting with Fr. John at St. John’s Episcopal Church to talk about having our Masses there. On October 9, 2010, we hosted a presentation by theologian and archaeologist Dr. Dorothy Irvin in the St. Cloud Library. Irvin, a Catholic theologian and field archaeologist, documents archaeological evidence of women’s ministries, including ordained ministries, in the first centuries of the Catholic Church. On November 4, 2010, we named ourselves the Community of Mary Magdalene, First Apostle. On November 14, 2010, Bp. Regina Nicolosi celebrated our first womanpriest Mass at St. John’s Episcopal with dozens in attendance. The liturgy took place in the Parish Hall, followed by a potluck social—an indispensable part of our gatherings. In December, 2010, we discussed having a regular schedule of second Sunday Masses, or perhaps a communion service in case a womanpriest was not available. On December 12, the anniversary of the first Mass, Mary Smith celebrated Mass at St. John’s Episcopal in the parish hall, and led a short forum afterward, attended by about 35 people. On January 27, 2011, we met at St. Scholastica’s Convent to watch a DVD of Patricia Fresen addressing a group in Minnesota. After viewing it, Bernie Sykora told us that she felt called to be a woman priest. Since November, we have gathered for a Mass at St. John’s Episcopal every second Sunday of the month. Marty Meyer-Gad presided over our liturgy in January of 2011, but in February Mary Smith, who had begun to feel like our pastor, again was available. 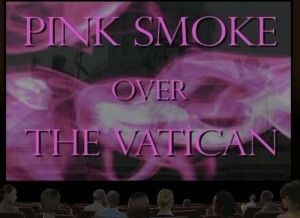 At the social afterward a considerable crowd viewed the film, Pink Smoke over the Vatican, a documentary of our movement. It presents, positively, the controversial ordination of Roman Catholic women in defiance of the Vatican’s severe censure and punishment, including excommunication. Among the notables featured are Fr. Roy Bourgeois, whom the Vatican forced Maryknoll to dismiss from their order, and Bp. 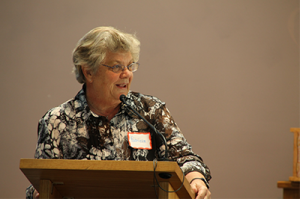 Patricia Fresen, former Dominican nun who likens sexism in the Church to apartheid in her native South Africa. In March, Bishop Regina Nicolosi presided over a Pentecost liturgy in a red vestment made by Tildy Ellis, whose artistic talents continue to provide liturgical decorations for our services. Mary Smith celebrated our liturgies in April and May. In June, Regina Nicolosi came back to celebrate Mass and to announce that Bernie Sykora had been accepted into the RCWP diaconate program.After the social we had a meeting to discuss the purpose of our community, the beginning of our mission statement. After our liturgy on July 31, 2011—in the sanctuary for the first time—we hosted a forum that featured special guest Roy Bourgeois along with the documentary, Pink Smoke Over the Vatican and a short talk by Dr. Dorothy Irvin. Bourgeois spoke about the necessity of heeding the inner voice even when it opposes human authority. We estimated attendance around two hundred. After our liturgy on September 11, 2011, Bp. Regina Nicolosi installed Mary Smith as our pastor, ending the constant search for a womanpriest to preside over our monthly Mass as well as solidifying a blessed relationship. At our meeting to plan the October liturgy, we decided we would not comply with the Mass language changes imposed by the Vatican and scheduled to take effect in December of that year. After the November liturgy CPA Paul Lipetzky met with us to discuss establishing Mary Magdalene as a non-profit organization. On December 17, 2011, we had our first Mary Magdalene, First Apostle, retreat at the Spirituality Center of St. Benedict’s Monastery with Mary present. At our December meeting we listed possible forums to follow every monthly Mass in the future, having noticed that they are well received. On January 8, 2012, The St. Cloud Times featured Mary Smith in a long article about womenpriests. On March 17, 2012, our beloved S. Marilyn Kulzer, who had been with us from the beginning, died unexpectedly. Our liturgy on April 8, 2012, happened to fall on EASTER. Kevin Carlson played the guitar for the first time, and he has since become our director of music. 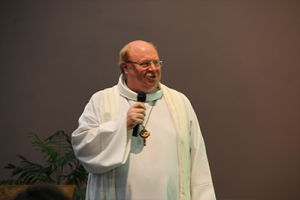 On April 15, 2012, Bernie was ordained a deacon in Indianapolis. Bp. Patricia Fresen of South Africa, currently working in Germany. In September we had our first Fourth Sunday Spiritual Reflection, a practice we have continued each month. 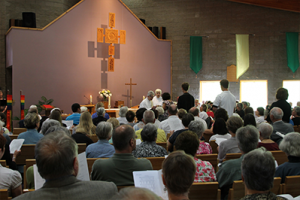 On June 23, 2013, we hosted an ordination of priests for RCWP Midwest at St. John’s Episcopal Church. Ordained were Bernie Sykora of St. Cloud, Martha Sherman of Salem, SD, and Corene Besetzny of Red Wing, MN, to the priesthood. Bishop Regina Nicolosi presided and ordained the three women. Paul Lipetzky steered Mary Magdalene, First Apostle, legally and financially through 2012 and 2013, securing our status as a non-profit corporation, producing monthly and yearly financial reports as treasurer, and serving as accountant and financial advisor during our hosting of the ordination. Paul died of a stroke on December 23, 2013, a grievous loss for our group. On January 12, 2014. Alec Smith, artist son of Pastor Mary, unveiled his painting of Mary Magdalene. It was displayed during our Mass and he led a discussion of its imagery in a forum after the service. The painting commissioned by Bernie will be displayed at all our Masses. Women continue to be called to the priesthood. 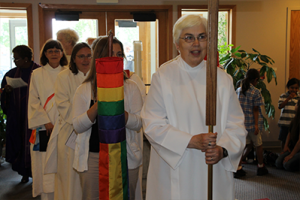 Josie Petermeier, who often serves as acolyte at our Masses, was ordained a deacon on May 4, 2014, in Prospect Park United Methodist Church, Minneapolis, and she soon will be ordained a Roman Catholic womanpriest. Ruth Lindstedt, also of our group, is studying for her Master of Divinity degree in the School of Theology at St. John’s University, Collegeville, and has been accepted for discernment into the RCWP formation program. We continue serving Catholics and all awakened Christians, wherever they are on their journeys. “The exclusion of women from the priesthood is a grave injustice against women, our Church and our loving God who calls both men and women to be priests. When there is an injustice, silence is the voice of complicity. “All the world religions agree that the acid test of any theology, any spirituality, is that it leads the faithful to the practice of compassion and to the recognition of the sacred in others. "Like Mary Magdalene, we proclaim through our lives and celebrate in our worship that we have seen the Christ." To accept each other with all of our differences might be the greatest sacrifice we are asked to give. The blindness of historiographers to any suggestion that a woman was officiating at the altar leads us to suspect that certain “blinders” must be screening the clues and texts.